Nematodes are a big problem for home vegetable gardeners, especially when vegetable production goes down. In Florida, there are no approved chemicals for use in home gardens. To battle nematodes, use some of the cultural practices in this post. As a result, you will get more crops and less damage, and all without using chemicals. 1000’s of species of microscopic roundworms live in nearly all habitats. Most nematodes are beneficial and feed on bacteria, fungi, or other microscopic animals. Plant feeders have needle-like mouthparts to pierce cells and consume juices. Plant feeders can interfere with the plant’s uptake of water and nutrients. 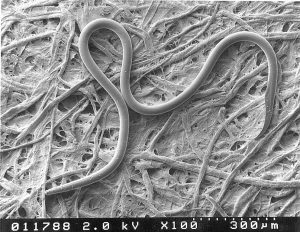 The most problematic nematodes in vegetable gardens feed in on roots. A nematode assay is needed to determine if nematodes are present. What can we do about nematodes? Grow nematode ‘resistant’ or ‘tolerant’ plants in the garden. If damage is evident, plant a crop that will be more tolerant. Find a list of plants that nematodes love at http://edis.ifas.ufl.edu/ng005 When possible, choose plant varieties that are labeled ‘nematode-resistant’. Add organic material to the garden soil. Organic material helps soil hold moisture and nutrients, and it improves the soil structure. Healthy plants are more likely to survive, even with pests. Additionally, adding organic matter creates a better environment in which natural enemies thrive. Time your planting so each crop grows during its coolest temperature range. Nematode populations go down as temperatures go down. Plant each crop at it’s earliest spring recommended date. Plant fall crops as late as possible in the cool season garden. Remove all roots and plant parts after harvest. Pests may still be alive in them. Work the soil several times. Nematodes die when exposed to sun and dry soil. Grow vegetables in containers off the ground if you want a fresh start. Use only clean potting soil and don’t add soil from the garden. Use these recommendations to Battle Nematodes in your vegetable garden and improve your harvest. Hello. I am the Residential Horticulture Agent and Master Gardener Volunteer Program coordinator in Columbia County.